IN FEBRUARY 1534 a radical religious sect whose disciples were being persecuted throughout Europe seized the city of M nster, in the German-speaking land of Westphalia. They were convinced that they were God's Elect, specially chosen by the Almighty to be the first to ascend to Paradise on Judgement Day, as told in the Book of Revelation. And it would all happen here, in 'New Jerusalem' (as they renamed the city), during Easter 1535, when God and Christ would descend and usher in the End Times. But the 'Melchiorites', as they were called after their founding prophet, would be well-prepared for Apocalypse, swiftly turning the city into a Christian theocracy- They threw out the Catholics and Lutherans, 'rebaptised' their followers, destroyed all old religious icons, adopted a communist system of shared property, and imposed a new law of polygamy that compelled all women and girls who'd reached puberty to marry. Because women outnumbered men about three times, many men had 3-5 wives. John of Leiden, who proclaimed himself 'king' of New Jerusalem, had 16 wives - all according to God's exhortation in Genesis to 'go forth and multiply'. The backlash against the sect would be long and brutal. The Catholic and Lutheran powers were determined to make a terrible example of what they saw as a dangerous mob of crazed heretics. And so began the siege of Munster. For 18 months, the city was shut off from the world, periodically attacked and then slowly starved. And yet, for most of this time, the sect clung to their faith with astonishing resilience, even as they descended into hellish suffering. 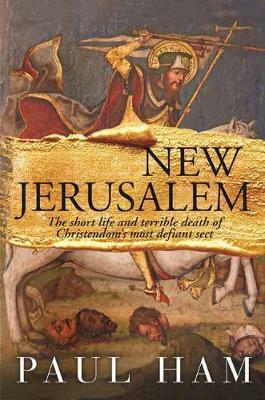 'New Jerusalem- Judgement Day 1535' is a story of religious obsession and persecution, of noble ideals trampled to dust, of slavish sexual surrender....all in the name of Christ. It tells of one of the first violent revolts of the Reformation, which, together with the Peasants' War of 1524-25, helped to ignite 110 years of religious conflict that ended with the Treaty of Westphalia in 1648.